Contributors: Gulzaar, Raghuvir Shekhawat, Paulami DuttaGupta, Nethra A, Deepali Junjappa, Meera Bharadwaj, Rubina Ramesh, Janaki Nagraj, Priyaa Trippayar Sahasranaman, Brindaa Lakshmi, Reshma Ranjan, Aparajita Dutta, Ahana Mukherjee, Nehali Lalwani, Rochelle Potkar, Subha N Nivedita and Dr. Tahmina Khaleel. Having left her day job in 2012, Paulami took up full time writing. Her first novel, “Pinjar” released in early 2012. Her second novel “Unplanned Destinty” released in 2014. She is also the screenplay writer of the national award winning Khasi film – “Ri Homeland of Uncertainty”. “Ri” has been adapted into a novel and is releasing in Spetember’14. She is currently working on her next project as movie script writer. Apart from writing full length novels, she has written several short stories and articles. She has also contributed to the “Minds@work Anthology” and the “Family Matters International Anthology” in 2013. Recently she has contributed to the “Learning and Creativity Anthology” , “Her Story Anthology”, and “Celebrating India – Love across Borders Anthology”. When she is not writing or watching movies, Paulami is either reading biographies or classic pieces of literature. Cricket, food, cinema, books and music are an integral part of her life. The first thing you notice about this book is its uniqueness. 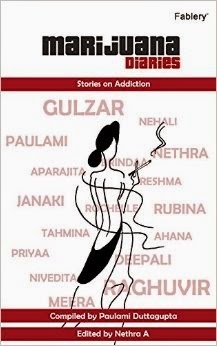 Having an anthology on addiction is a novel concept, completely different from all those anthologies that are flooding the markets in the recent times.This book is a perfect concoction of love, deceit, desire, greed, lust and all that you could associate with addiction. Things which seem to be your life, turn into the very things that result into your death – such is the power of addiction. The stories are unique and distinct with a very strong tone of their own, each setting a new benchmark in itself. Having said that I would also like to add that this book is not for people who are light readers. This book is for a niche audience who enjoy reading, are willing to read between the lines and are able to guess all that is left to the reader’s imagination by the authors. It is not a light and entertaining read. On the contrary it is a read that will haunt you long after you are done reading it. Some worth mentioning authors – Janaki Nagaraj, having read her blog and stories before with this one the author has finally arrived. She has grown as a writer in this one and it shows in the finesse with which she has written her story. Second favourite would be Rochelle Potkar’s story. Take a bow Rochelle! You have outdone yourself with this one. Not to forget Rubina Ramesh. Her short story holds the potential of becoming a full-fledged novel in itself. Though it did leave me wondering as to where the addiction angle was in this, nevertheless the story is absolutely magical. Her writing so fluid that a reader has no choice but to get engrossed in it deeply. Brinda Lakshmi’s story talks about the most common fear amongst women and she explores this addiction so naturally that you would feel it is your heart talking aloud. Nehali Lalwani’s story brings out the human ethos so very well that it moves you to tears, while you have Nivedita’s story that has you in splits. Narration at its best, holding onto the magic of short stories that always have one simple rule – short and sweet. Having talked about the strong points now let’s look at the flip side. Coming from Fablery I had a lot of expectations from this book atleast in the editing department where it failed, disappointing me big time. Some so very common mistakes have been ignored that it is a dampener for a book that has likes of Gulzar as of one of the authors in it. Secondly some stories are too deep and mystical making a reader brood which is very good but then there are quite a handful where it takes a while for the reader to understand what the actual addiction in this story was and its plot. Some stories held a lot of promise when they began but fizzled out somewhere in between leading to a very damp ending making me go back to the beginning and read it all over again to get the crux of the story. One of the reasons why I read one story every night and let it stay in my psyche till I could get complete hang of it. Otherwise writing a review would have been difficult. This makes the book fall into a category where it is not for the masses, as not all can connect with its depth. I would recommend this for the sheer brilliance of work some stories are, they definitely are worth a read.The writers have managed to redefine addiction for you and take you on a new high, albeit a literary one! 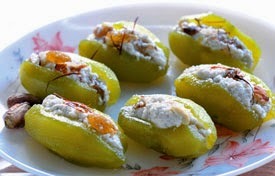 This book is like parwal mithai - Rare, unique, sweet and nevertheless enjoyable but might not suit everybody's taste buds. Thank you very much, honoured indeed. We emerging writers need this kind of boost and yes, the critique will help us grow. I will always remember your words Dear Privy. Thank you for your wonderful and encouraging words. We did try our best to keep to the theme as much as possible but I suppose the addiction I chose was too subtle (Will pm and tell you - not at all :P) But when I wrote it I saw superstition as an addiction which makes us do things beyond our normal behavior . In this case the father of the girl. But if I have to explain that means- I should have been more powerful with my words. Accept that humbly from you. And a big <3 for being the first one to review a story which I wrote. Thank you. It is always a pleasure reading you Rubina be it on your blog or your stories in anthology. This is your second story that I read after Indireads anthology and yes I loved it. As I said it holds the potential of turning into a whole book in itself. And it was a magical feeling reading it, the words were so powerful that they haunted me for long after I finished reading. Nevertheless a brilliant effort undoubtedly! Thanks Privy, for our first review. A collective effort of the writers to draw insight to different forms of addiction even which we never considered one. Felt like going through the stories again. Even mine about pessimism, very subtle one but often made me wonder how it easily wraps around u making u see in a light which is better avoided. Thanks once again. Oh yes absolutely Reshma as I said some stories were too deep, a reader had a lot of grasping to do which someone like me would love to. I really enjoyed your story because of the subtle tone it carried. It was a pleasure reading and reviewing such an amazing book. Thanks for stopping by!